'The Isue with Tamerlane' is the 11th volume of e-series 'History: Fiction or Science?' is not a minor one as Tamerlane incorporates TWO distinct persons. Morover, not a drop of Ghengis blood in neither of them. 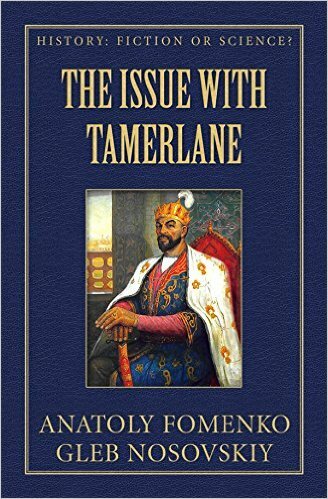 Tamerlane was a collation of Slavic and Turkic warlords. The book contains abundant data, illustrations, charts and formulae containing irrefutable evidence of mathematical, statistical and astronomical nature. Feel safe to use them in your eventual discussions with the avid devotees of classical chronology. In fact, before reading this book, you have most probably been one of such devotees. After reading History: Fiction or Science? you will develop a more critical attitude to the dominating historical discourse or even become its antagonist.You will be confronted with natural disbelief when you share what you’ve learned with others. Now you are very well armed in face of inevitable scepticism. This book contains enough solid evidence to silence any historian by the sheer power of facts and argumentation. simulacrum brooding over the snake pit of mediaeval politics. Twice so, in fact: the first seeing the legendary millenarian dust on the ancient marble turn into a mere layer of dirt – one that meticulous unprejudiced research can eventually remove.The second, and greater, attack of unease comes with the awareness of just how many areas of human knowledge still trust the elephants, turtles and whales of the consensual chronology to support them. Nothing can remedy that except for an individual chronological revolution happening in the minds of a large enough number of people. In the meantime read the last chapter 'What the mainstream historians say about New Chronology theories?'. Dr Fomenko and al were ready to recognize as scientist their mistakes on condition that radiocarbon dating methods or dendrochronology stand the black box tests or astronomy refutes their results. At present they do no, they cannot, they will not. The radiocarbon laboratories make their very expensive tests only is the sample to date is accompanied with idea of age delivered by historians. Labs finetune dates to order. Circulus viciousus is perfect. Consensual chronology is saved!